A trip into the studio. Ah, for starters, we have an empty mushroom can, punched through multiple times with a nail, submerged in a Ball mason jar of odorless paint thinner. This allows for sediment to settle (cheaply) to the bottom as brushes are cleaned against the perforations. 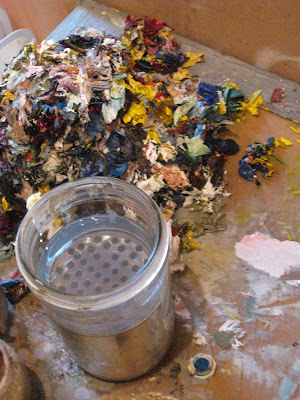 In the background is my ubiquitous pile of paint scraped from the palette. 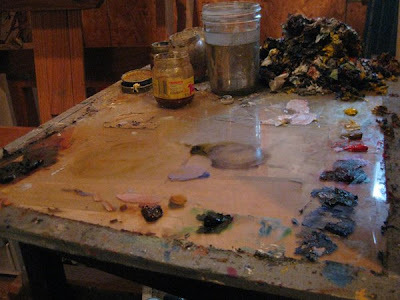 The palette itself is a sheet of masonite topped with a sheet of glass, amply duct taped around the edges and propped on top of an end table. The idea here is that the masonite will provide a nice neutral—a (rather warm) 50% gray—upon with to mix colors, lending a sense of relativity to the values and intensities mixed up. The glass allows for smooth cleanup with a razor blade. I tend to use, in light to dark rainbow order, toothpaste-sized globs of Titanium White, Cadmium Yellow Light, Naples Yellow (occasionally), Yellow Ochre, Cadmium Red Light, Quinacridone Rose, Permanent Alizarin Crimson (dries faster and is more lightfast than regular A.C.), Ultramarine Blue Deep, Cobalt Blue, Cerulean Blue, Sap Green, and a guest appearance at the end by Transparent red earth. 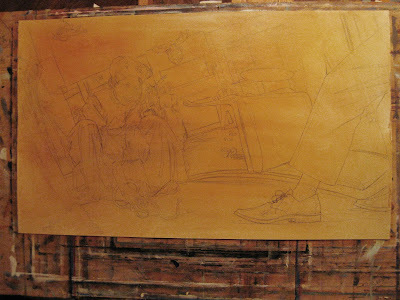 Occasionally burnt umber and Prussian Blue get to sit in, too. It would be awful nice if I'd ever gotten around to puttying and painting my walls/ceiling up here, but somewhere in the middle of racing to finish an attic studio, a kitchen, and a nursery in our house, my first son was born. So I now just try to keep in mind that the particle board walls here (couldn't get sheet rock up the narrow, twisting stairs) make the light exceeding warm when I'm mixing colors, and adjust accordingly through the magic of unscientific guestimation. 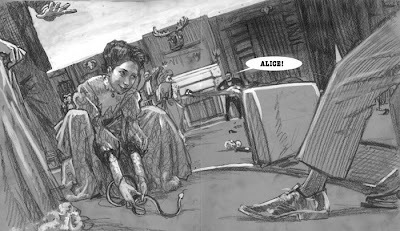 ...which was assembled from fair amount of period photo reference, building floorplans, ebay auction photos, and reference photos of a student of mine, dressed in $60 worth of (ebay) hundred year old clothing, cross referenced with other photographic period clothing reference. Halfway through our photoshoot, my good camera died, leaving me with only my phone to finish up with. Sooo professional. 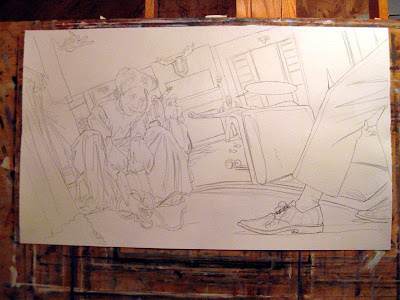 The sketch was then printed up at about 150% (the heads were comfortable to draw and paint at that scale...) and transfered via a light table to Fabriano soft press watercolor paper, which had been treated with a 50/50 solution of PVA adhesive and water, leaving it impervious to the elements but still feeling like paper. 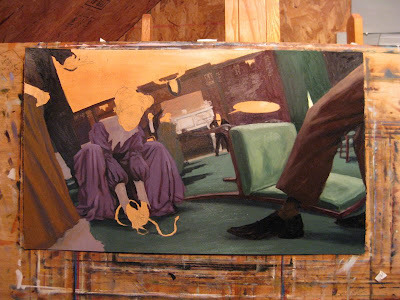 Working in blocks of minimally modeled, muted local color to establish shadows and midtones, the painting is blocked in, usually over about 4-8 hours. I'm thinning the paints with a combination of turpentine, thickened linseed oil, and venice turpentine, which imparts a fairly impasto-free (no lumps), smooth surface, due to the venice turpentine's tendency to "level," or flatten out once applied. 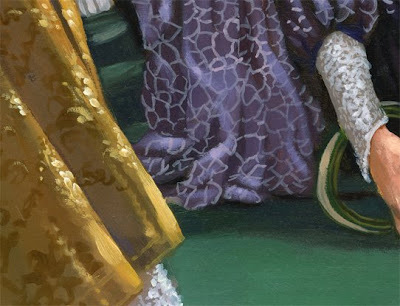 When painting for reproduction, I've found this can help limit reflections and unpredictable sheen when the scanning is done. Thickened linseed oil (I usually use Winsor Newton's) is already half polymerized, which, while making it more viscous, also speeds along dry time. I typically add a few drops (literally) of cobalt drier to the mix, after which the underpainting will be dry to the touch and ready for a second coat in about 24 hours. I have in the past started with faces, following advice I received once that if one screws up the face, there's really no point in finishing. 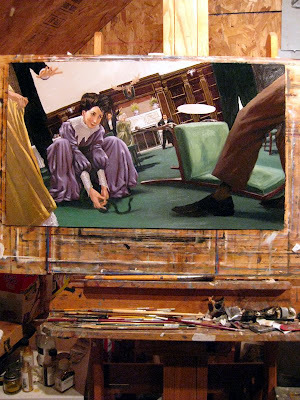 This can make the portrait aspect of the painting too "sacred" right off the bat, at least in my case, so I like to get a bit of the atmosphere and temperature nailed down first. Then I break out the little brushes. 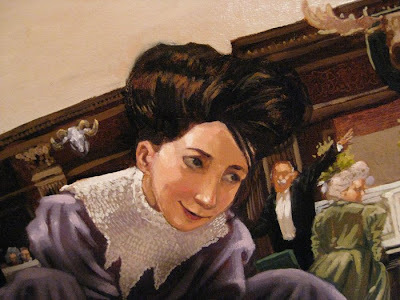 I'd still hesitate to say I'm erring on the side of detailed realism; for the most part, my surfaces never transcend from being paint into, say, satin, wood or hair. When the size 1 round brush comes in, it spends a lot of time just cleaning up edges and producing smaller matrices of painterly dabs and blobs. A lot of time gets spent hiding colors inside of each other, trying to play up coloristic temperature shifts to activate as much of the paint surface as possible. 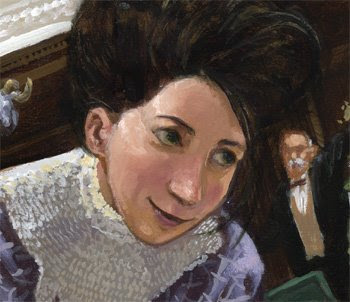 The entire project won't be due for another month or two, so I'll keep this painting out and visible while continuing to work on the remaining spreads and spots, checking character consistency and attending to occasional tweaks. 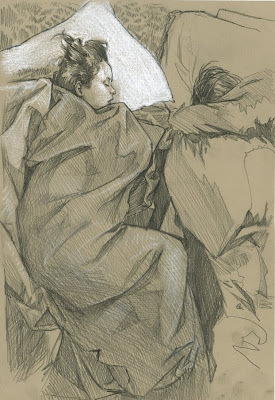 oil on paper, 17.75 x 30. 2008. 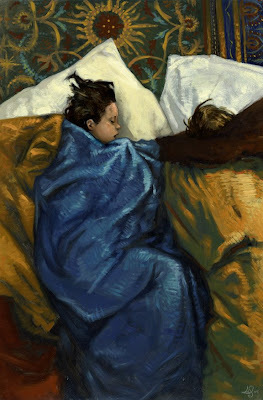 Sleepover, 2005. oil on paper, 15" x 22". Open Letter to the House of Representatives. I'm writing you for your desperately needed help as a constituent, and as a creative professional eeking out a living in the US, primarily as an illustrator of children's books, urging you to PLEASE do what you can to prevent HR 5889 from going onto the House calendar for a vote, and even more importantly to NOT adopt the proposed Senate version of the bill, which was passed in relative secrecy one week ago. 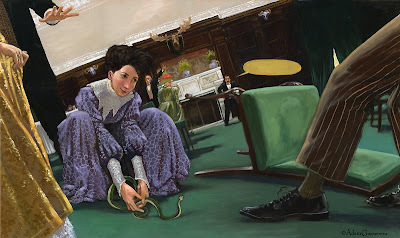 The Senate bill on this subject, the Shawn Bentley Orphan Works Act, makes egregious changes to existing copyright law, some of which go so far as to trample articles of international treaties on the subject. I'm urging you to not allow the adoption of the Senate version of this bill in the House. The Orphan Works legislation as it is currently written—and particularly in it's Senate form—would put a terrible burden on those of us working as small business owners, earning lower- to middleclass incomes licensing copyrights for our diligent, highly specialized and personal work in the educational, advertising, fine arts and publishing sectors. These bills would overhaul the protections intrinsic in our society's understanding of intellectual property that allow our work to even exist, and must be CAREFULLY considered for the potential harm they would do to our nation's entrepreneurs and artists for the benefit of small time infringers and large corporate interests. While their professed intent is to protect and free up our nation's rich visual culture, they would in fact do irreparable harm to the rights and livelihoods of those who create and contribute to that culture, even going so far as to provide a deterrent from continuing to create and build on that artistic heritage. Please do not allow this legislation to squeak by in its current form, not while the nation's eyes are averted by other crises, crises that–like our current economic issue–stem from allowing the self serving and material interests of a few to run roughshod over some of the principles and individuals that make our country great. be realized if the House follows suit. 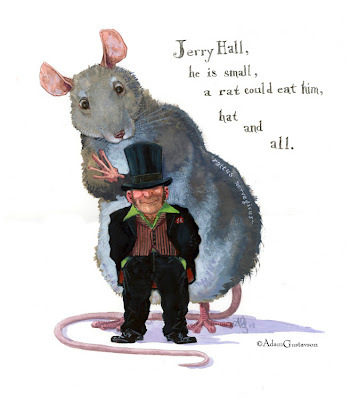 ...a rat could eat him, hat and all. There was a crooked man. Who walked a crooked mile. 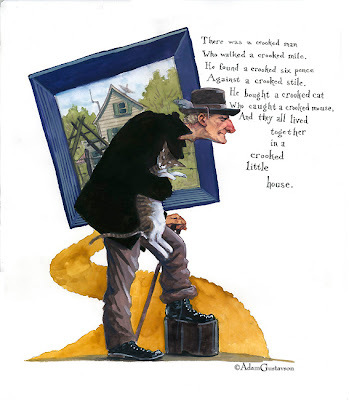 Aside from the wonderful weirdness of this nursery rhyme—it reads more like a Tom Waits boozer than an evening lullaby—there were some things in particular that excited me once I decided the crooked man would have a mean case of scoliosis an over-sized orthopedic shoe. The main detail was the stile. A stile is apparently a human passageway through or over a livestock fence, sometimes a narrow opening, sometimes a small series of steps, and other times a pairing of ladders. Whatever the variety, they are never handicapped accessible, and the "crooked" quality of this one indicates it's not a simple opening between barbed wire posts. And the crooked man, pondering the impossibility of the short climb ahead, finds instead a crooked six pence at his feet. And that is enough for him to purchase for himself a crooked cat. I originally wanted a manx, a tailless cat...every see one walking? Crooked. 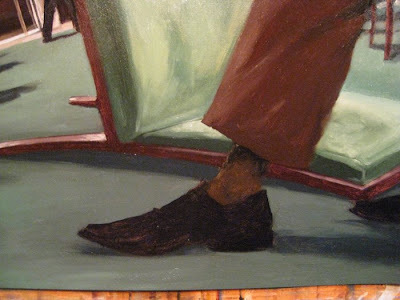 Of course, if this wasn't obvious enough, a cat with no tail in a painting could just look like an oversight, so I gave in and gave him a tail. And a crooked mouse (on the brim of the pork pie hat). After all that good fortune and comeraderie, where else could they possibly live together in all their curmudgeonly creakiness?